Championship predictor: What will final 2017-18 table look like? Will Sunderland bounce back to the Premier League at the first attempt? Can new signing John Terry inspire Aston Villa to promotion? Will the promoted clubs struggle to survive? Whichever club you follow, there are always high hopes at the start of any season. Maybe this will finally be your club's time to reach the top flight? The year your team "do a Huddersfield" by defying all pre-season predictions to win promotion? To mark the start of the 2017-18 Championship campaign on Friday 4 August, why not have a go at predicting how the final table will look? Make your choices - placing every team from one down to 24 - and then share it with your friends. How will the Championship table look at the end of the season? Pick how you think it will look at the end, placing all 24 teams in order. Have a go then share with your friends. We may be opening ourselves up to criticism from fans, players and managers of several clubs by doing this, but we have decided to try it ourselves. Remember - it is just a bit of fun! A group of 25 BBC Sport journalists who cover Championship football on a regular basis were asked to make their predictions, and their forecasts were combined to make a final table. In our defence, there are about 620,000,000,000,000,000,000,000 different combinations, so the chances are that we will probably end up getting it horribly wrong! Our journalists were asked to place each Championship team in positions one to 24. The first-placed team was given one point, the second-placed team two points and so on. Once all predictions had been received, all of the points for each individual club were added together and then divided by the number of responses (25) to give each club an average position. The team with the highest average position was placed first in the final table, while the side with the lowest average position was placed 24th. What do you think of our selection? Let us know using #bbcefl on social media or use the comments section at the bottom of this page. Some of your responses will be used in BBC Sport's live text coverage during the opening round of English Football League matches. How did we rate your club? Eleven of our journalists predicted Middlesbrough will be champions, while five went for Aston Villa and four chose Fulham. There were also votes for Sheffield Wednesday (two), Derby, Sunderland and Wolves. Boro, Fulham and Villa each had 22 votes to finish in the top six, while nobody predicted any of those three clubs would end the season outside the top 10. Three thought the Tigers would finish second and four more had them finishing in a play-off place, but six had them ending the campaign in the bottom half of the table. Sunderland's range was even more extreme, from first to 21st, with 16 placing the Black Cats between seventh and 12th in the final table. Sheffield Wednesday (18) were the most popular selection to finish in one of the four play-off positions, but only three tipped them to clinch an automatic promotion spot. Only seven predicted that Reading, who were beaten play-off finalists in May, would finish in the top six again in 2017-18. 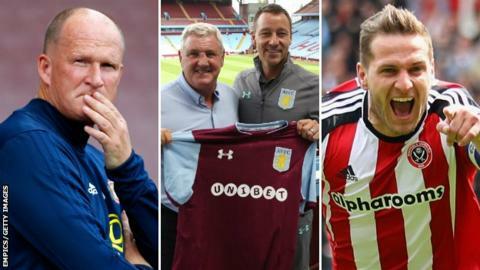 West Midlands trio Aston Villa (up 10 places), Wolves (up nine) and Birmingham (up seven) were the three clubs tipped to improve most on their final positions from last season. Barnsley (down seven places) and Preston (down six) were the two predicted to have the most dramatic falls from where they ended in 2016-17. Nobody predicted League One champions Sheffield United would end the season in the bottom three, while three have put the Blades down for a top-half finish in their first campaign in the second tier since 2010-11. Nine thought Bolton would be relegated, while 18 predicted that play-off winners Millwall's stay in the second tier would last only one season. Only four of our 25 journalists predicted Burton would survive, while eight thought the Brewers would finish bottom of the table - the most of any club. Eight teams - Burton (21), Millwall (18), Bolton (nine), Ipswich (eight), Barnsley (seven), Nottingham Forest, Preston and QPR (three) - had at least three votes to be relegated in 2017-18.